Be sure to check out the BBQ House online shop. You'll find our signature BBQ sauces, gift cards and more. New 2014 shirt designs are in. They can be purchased online. No need to cook tonight! 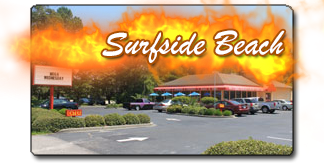 The BBQ House was established in 2005, offering Oak Island residents and guests an innovative BBQ-dining experience. 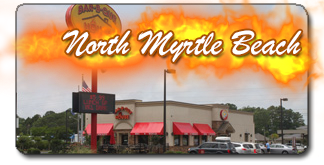 Founded on North Carolina’s love of barbeque, the BBQ House slow-smokes the finest quality pork with hickory logs, each day, at our on-site facility. Then, we offer our customers a mix of sauces – from Eastern NC vinegar sauce, to Lexington style red sauce, to our own tasty House sauce and now our new South Carolina mustard sauce … you’re sure to find one that’s to your liking. Combine your BBQ – be it pork, ribs or chicken – with the world’s best hushpuppies and corn nuggets – and you’ve surely got the “Best BBQ on the Beach! 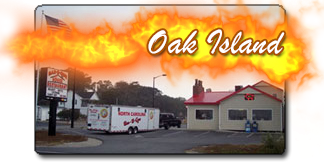 Oak Island Location Now Opens at 7 AM Serving Breakfast! © 2013 - The BBQ House. All rights reserved. Developed by tru2mobile.